Fleet Farm Weekly Ad February 8 - February 16, 2019. Happy Valentine's Day! 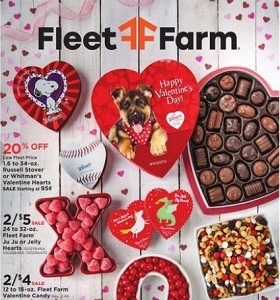 Fleet Farm Weekly Ad February 8 – February 16, 2019. Happy Valentine’s Day! -$289.99 Petmate Red Barn Ranch Chicken Coop; $29.99 55″ Golden Labrador or 53″ Unicorn Plush. To see the weekly circular for your favorite Fleet Farm store, search by ZIP Code or city, state. Check back for new coupons and weekly ads. No related weekly circulars and ads. Walmart Weekly Ad April 21 – April 25, 2019. True Blue Promise! ShopRite Weekly Ad April 21 – April 27, 2019. Springtime Family Meals! Fleet Farm Weekly Ad April 19 – April 27, 2019. The Garden Center Is Open Season! Staples Weekly Deals April 21 – April 27, 2019. Recycle Tech! Stop & Shop Weekly Ad April 19 – April 25, 2019. Happy Easter! Shaw’s Weekly Flyer April 19 – April 25, 2019. Happy Easter! Price Rite Weekly Ad April 19 – April 25, 2019. Cook’s Smoked Hams! Key Food Weekly Ad April 19 – April 25, 2019. Amy’s Frozen Full Line Sale! Saving money has never been easier. Find all weekly sale circulars and ad in one place! Please browse the weekly flyers before you go to shop in order to save hundreds of dollars a year. © Copyright 2017 - Weekly Circulars and Ads.